Hello again! 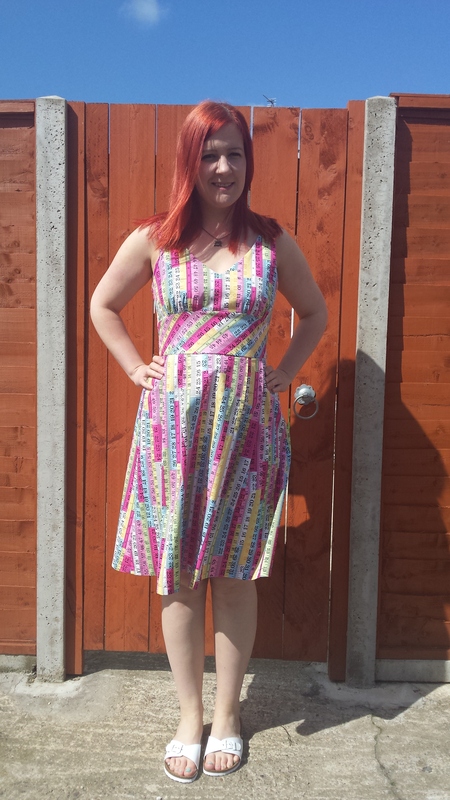 I am rather excited to show you my April Minerva make for their blogger network, which I’m also including for the Sewcialist’s Pink April! I love this measuring tape fabric, and when I found that Minerva stocked it I was so pleased. They do it in four different colourways (red/grey, orange, pink and purple) and I like ALL OF THEM. 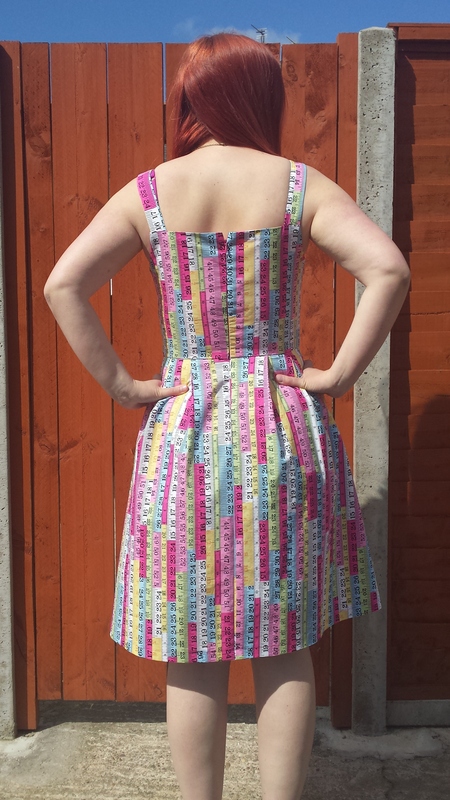 Would it be too much to make another three dresses with the other three colourways?! I’m sure it’s been done before. Anyway, I went for 3m of the pastel pink version, with some hot pink polycotton lining and hot pink invisible zip, and I chose New Look 6776 as my pattern. So, for this make I was all ‘oh I think I’ve lost weight so I’ll cut a size smaller’. Then I measured myself and the dream was shattered. So I traced the pattern in the size I thought I wasn’t anymore, and guess what? Yup, it was too big. So the dream of cutting a smaller size came true, but only after wasting AN ENTIRE TWO HOURS of tracing the larger size and making a toile. 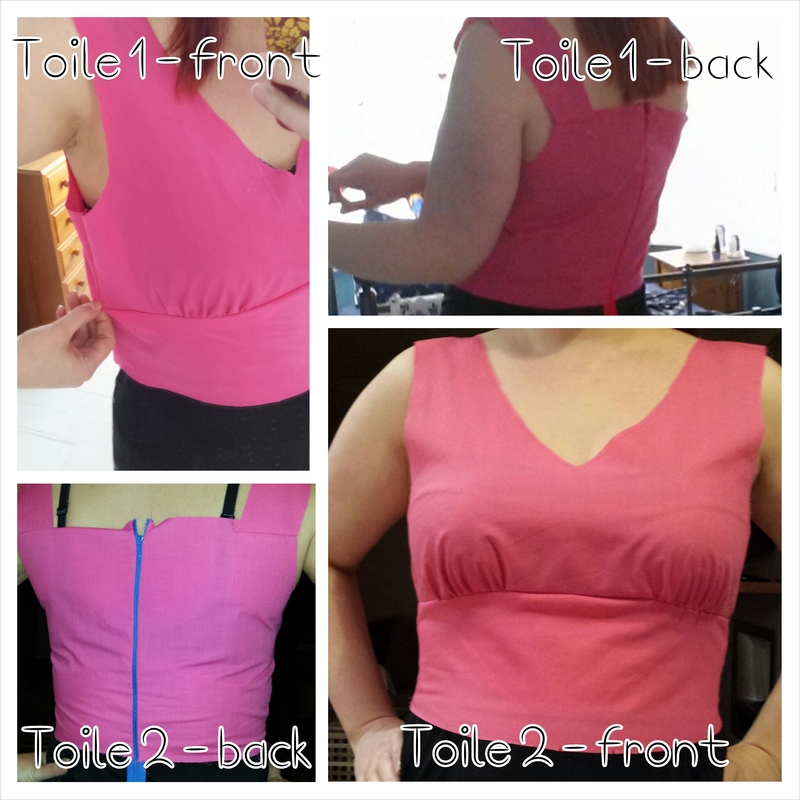 I was a bit apprehensive about making the smaller size, because I felt sure that I would have to do a Full Bust Adjustment, given that the finished garment measurements given on the pattern envelope were indicating that the bust on the smaller size would be 2.5 inches smaller than I needed it to be. I’ve done FBAs before but never on a gathered bodice like this one, so although part of me liked the idea of a challenge, part of me was like ‘oh please just magically fit my bosom’, and happily it turned out that it did fit without the need for FBA, and I could use my second toile as the lining for the finished garment – hurray! After the toile-making, the making of the dress itself was very straightforward, and took four and a half hours including the cutting of the fabric. Not bad eh? And it was ready in time for Easter, which was perfect because the colours in this fabric are totally reminiscent of Mini Eggs. The midriff section is cut on the bias, which breaks up the vertical stripes of this print nicely. I have a few improvements I’d like to make to the dress if I were to make it again. I wish the skirt had pockets, so I would include those next time. The zip is a bit tricky to unzip due its position – perhaps a side zip would be better on this dress. Finally, my bra shows at the side, which I totally did not notice when I made the toiles as I was focusing on fit more than anything else. I’d like to redraft the arm holes next time to get better bra coverage! Other than these little niggles though, I am very happy with the dress. I can’t wait until it’s actually warm enough to wear it on a regular basis with sandals and bare legs. I hereby summon you, summer! Thank you. It actually doesn’t gape – it is just cut lower than it ideally would be! Thank you, it is a fun print! Lovely print and pattern.You’ll be re-sizing again if you carry on running! Thank you. It has worked out well! You look fantastic! Love the measuring tape fabric. Such a fun print and flattering style — your new dress looks amazing on you :D! Ooh sounds lovely! Hahahaha don’t tempt me!!! Great dress. Love the gathered bit under the bust. I think that armhole issue is so easy to overlook. We are too busy checking the bust or back fit to notice other areas.definitely make it again. Definitely. I will pay more attention to the toile next time! Anyway, I can live with it & it isn’t majorly noticeable, especially if worn with a cardigan. Thanks Inge. 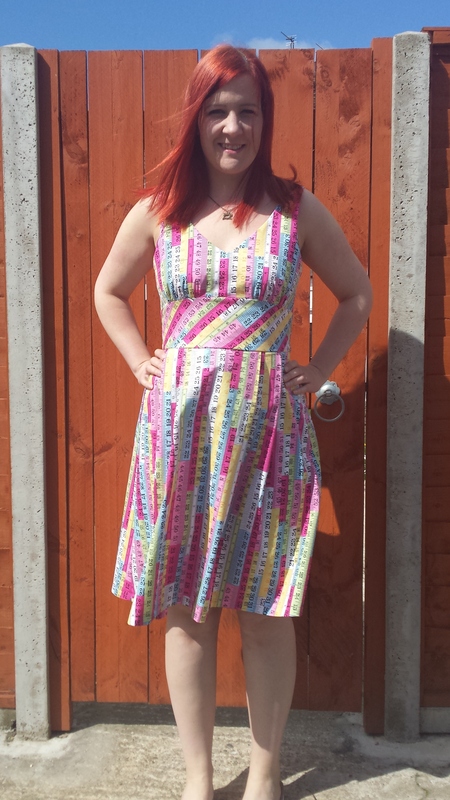 Yes, definitely need more sunshine for this dress! Thanks, me too! It’s been very rainy here recently! Lovely! 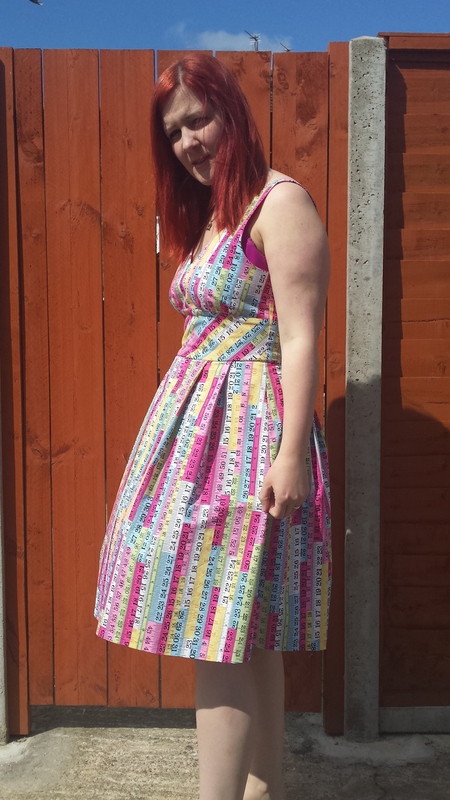 Good choice of pattern to show off the tape measure print! Thanks, it did work out well. I love this dress! 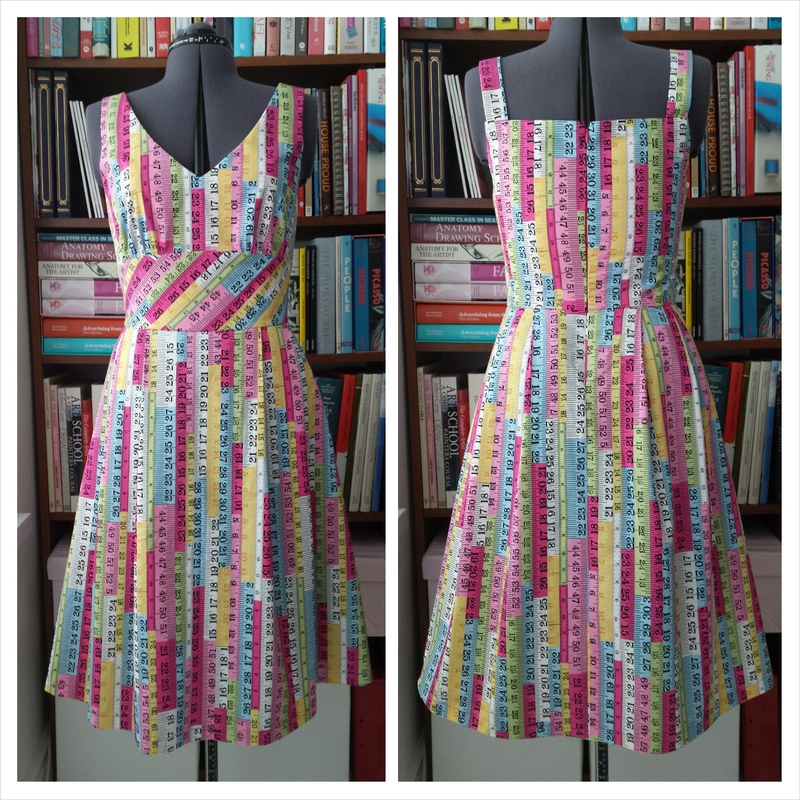 I’ve only just started a blog as I am new to dressmaking and it is so lovely to see inspiring makes. Thanks for sharing! I’ve just had a look at your blog. The fabric you have bought for your skirt is gorgeous! Good luck with the making – hope it turns out well. As soon as I saw this on my reader, I had to click through! I’ve often wondered how this fabric would look as a dress and you’ve proved it is a knock out. Perfect for a summer day, let’s hope it is here sooner rather than later. Thank you Claire. I’m pleased with how it turned out. Now let’s hope for lots of warm, sunny weather! Thanks Vanessa! Definitely get some of the fabric: it’s lovely quality and so bright and cheery! It is a nice pattern. I think it’s easy to overlook some of the New Look patterns sometimes as they are just that bit less attractively packaged.